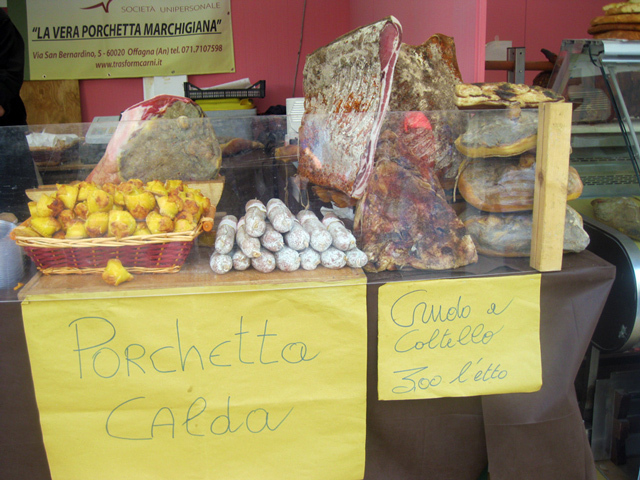 La porchetta, noble street food of Umbria and central Italy in general, stars in the May festival of San Terenziano, “Porchettiamo”. Best translated as “Let us roast suckling pig it”, your Italian/English dictionary won’t have a translation and you don’t need one: just head to San Terneziano to experience “porchettiamo”with the “locals” in this tiny hilltown near Todi. La porchetta (pork roasted on the spit, generously seasoned with garlic, rosemary, sage and wild fennel) and panini di porchetta draw the crowds to the stalls of vendors – or to their customized moveable trucks – in the piazzas, streets and weekly outdoor open markets all over central Italy. 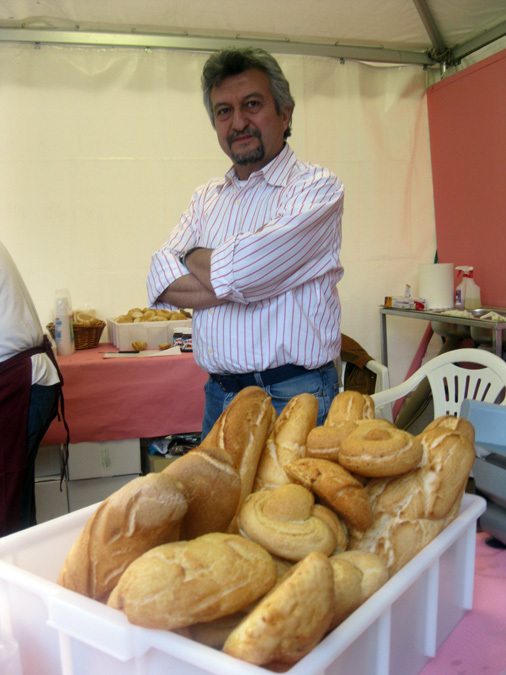 La porchetta is omnipresent at every Umbrian fiera, the traditional outdoor market on a saint’s feast day (or the day before or after the feast). We “porchettiamo” (I like that made-up word) here in Assisi for the Feast of St. Francis (on October 5th, the day after his Feast) at the porchettta stands of la Fiera di San Francesco. Gubbio porchetta stands welcome visitors on May 15th, the day of the Corsa dei Ceri, celebrating their 12th-century bishop and patron saint, Sant’Ubaldo. The Eugubini double-dose la porchetta: shoppers munch panini di porchetta on May 16th, too, while browsing la Fiera di Sant’Ubaldo. Grutti porchetta – top flavor! Perfect timing: after all, la porchetta, called by the Romans “maialis” ( “maiale”, i.e, “pig”), was the food dedicated to the goddess Maia. 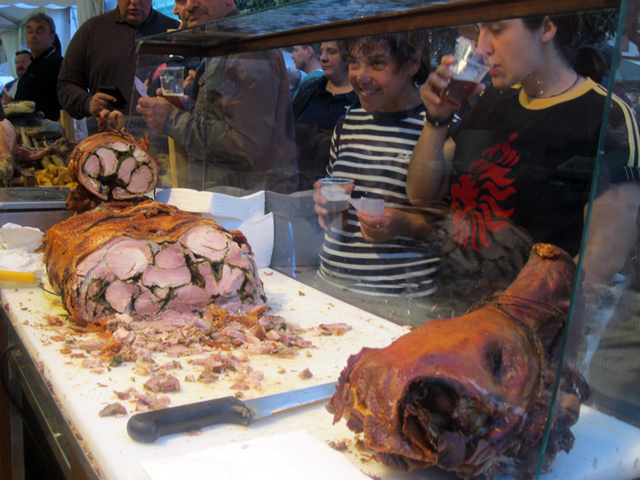 Every town, every city, every region “della porchetta” is invited to San Terenziano to offer porchetta tastes to critical visitors in modern versions of the old fraschette (small improvised gazebos, made of branches, i.e., “frasche”, “kindling”), the ideal place to enjoy un panino di porchetta con un bicchiere di vino rosso locale. Booths offering great wines – particularly Umbria’s famed Sagrantino – and prized artisan beers flank the porchetta booths. One booth even offers la porchetta in a variety of gluten-free panini for celiacs. 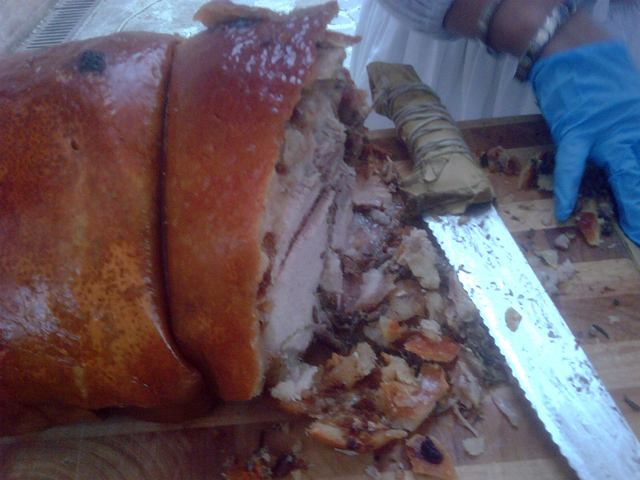 The more critical palates savor small tastes of different porchetta types which vary depending on the size of the roasted pig, the breed, the area where the pig was raised and its forage as well as how la porchetta was prepared (and nothing beats the traditional porchetta spit-roasted over the wood fire). Families and young couples share sandwiches, while others browse the booths near the piazza offering a variety of artisan crafts. 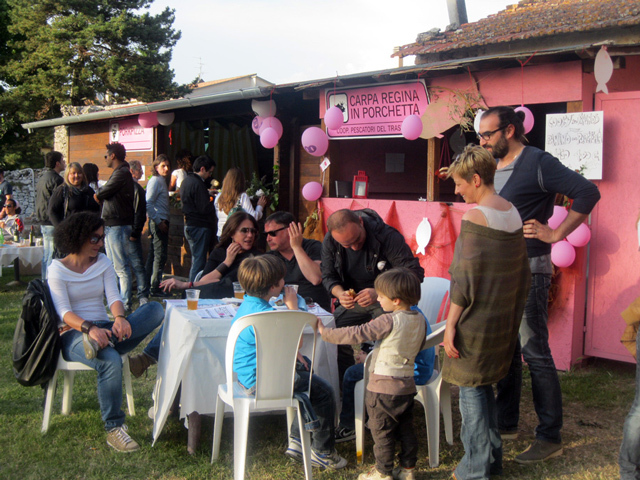 Some families enjoy a “pig-nic” served to them on the lawn behind town walls and young people enjoy live music played throughout the three days of “Porchettiamo”. Passing under the fortified city gate, visitors walk the cobblestone narrow street lined with artworks of Italian design students who turn pig forms into art. 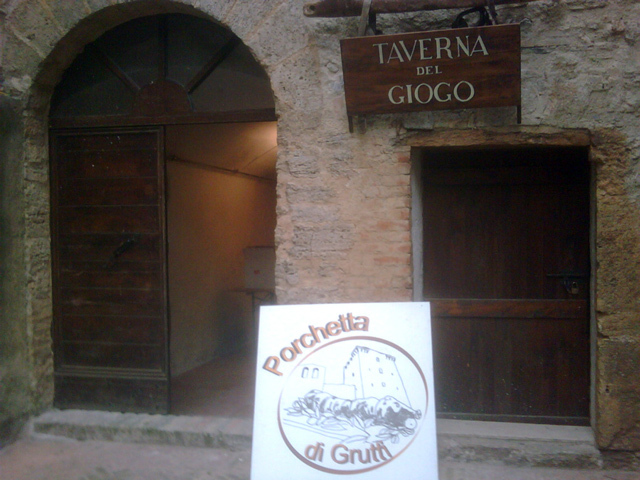 On the final day of Porchettiamo in nearby medieval Grutti (pop. 500) – home for centuries to skilled porchettai – young people in medieval costumes slice woodfire, spit-roasted porchetta (the best we had!) at a fraschetta in front of the town’s ancient tower. Nearby, a porchettaio in a hooded jute tunic shovels coals under a roasting prochetta, turning on the spit, just as in the Middle Ages. Until you notice that the porchettaio is puffing on a cigarette. Pazienza: concession made to a modern vice. And in any case, the anachronism can’t alter the flavor of that irresistbile porchetta.